Vegetable soup is probably my very favorite kind of soup, but let's face it, it can be bland, bland, bland. This soup is anything but bland! Full of delicious vegetables with a tomato-y broth and a little kick from some dried red pepper flakes. It's real secret is one can of condensed tomato soup...yup...just one can. The addition of the canned soup adds flavor and texture, but it still tastes 100% homemade. You can substitute almost any kind of vegetables for the ones I have listed in the recipe. I basically went with what I had on hand in the freezer and the produce drawer of my fridge. You can also use whatever kind of stock you prefer...I used chicken, but vegetable and beef stock are just fine too! Two whole cups of soup per serving clocks in at 2 points+...not too shabby for a bowl full of goodness that is full of nutrition! THE TOP TEN EDITOR'S PICK for 2011!!! AND WINNER of the Best Winter Soup Recipe on FavDiets- Jan. 2012! An adaption of THIS recipe is included in the cookbook, Prevention RD's Everyday Healthy Cooking! 1. In a 6 quart dutch oven or large stock pot, over med heat, warm oil. Add in onion and cook until softened. ( about 5 minutes) Add garlic and cook another minute or so until fragrant. Add red pepper flakes, thyme, marjoram, salt, pepper and bay leaf. Continue to cook for another minute or so. 2. Add in the stock and canned tomatoes and their juices and stir. Add in the potatoes and stir. Bring to a boil, turn down to simmer and loosely cover. Simmer until the potatoes are almost tender. 3. Add in the carrots, celery, and Brussels sprouts. Allow to simmer until the carrots are almost tender. 4. Add in the frozen corn and green beans and the parsley. Bring back up to simmer and cook until all the vegetables are tender. Add in the condensed soup and water and the lemon juice. Test for additional salt and pepper and season to taste. Remove bay leaf. You can garnish with fresh more fresh parsley and grated Parmesan cheese if you desire. Like many soups, this soup was actually even better the next day! If you don't have or don't want to use Brussels sprouts, you can substitute green cabbage...but I think the sprouts gave the soup an interesting twist! Sprout haters won't even know they are in there! You may have noticed, like most of my soups, I finish this one with a little bit of lemon juice. I have found that the addition of this acid at the end of a long cooking dish, brightens and freshens the taste up tremendously! I wouldn't make soup without it! I love all the veggies in this! It's the perfect veggie soup. Now that is a huge amount of soup for the points! I am so going to make this and I have to admit that I have never put brussels sprouts in soup but it's a brilliant idea. I love those little green gems! Thank you for sharing this recipe. I am actually looking forward to cooler weather and Fall. It has been so hot here in Northern CA with temps in the high 90's and our electric bill has been sky high. I don't want cold weather - just that little nip in the air that says Fall is here. 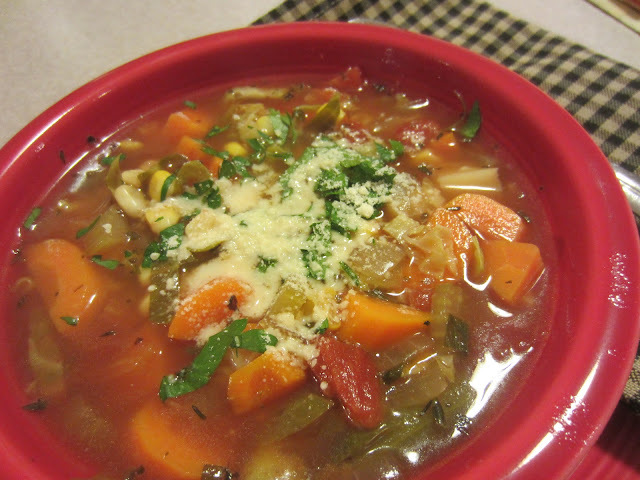 We just love a good vegetable soup and your recipe is delicious. This is a great recipe to welcome fall. Thank you so much for sharing with Full Plate Thursday and hope you have a great week end. I always love a good bowl of vegetable soup, and this version looks incredible. Thanks for linking this recipe up to my hop! have you tried this in the crockpot?